We’re a little bit earlier this year than our previous blog leading up to our last Focus on Imaging post, so we have a bit more time to talk about what we’ll be up to at the show! Focus on Imaging is an annual imaging show that takes place at the NEC in Birmingham, usually at the beginning of March. It’s also Europe’s largest – meaning all your needs and queries from image capture, to output and more are covered. 200 exhibitors from leading global brands and manufacturers mean there’s a world of knowledge and expertise to take advantage of. In short, if you’re involved with imaging in any shape or form – from hobbyist to professional – you really should be at the show! If you need further convincing, the highlights video from 2011 is well worth a watch. For those of you who have heard of the show, you’ll have probably already registered and saved yourself 20% off the regular admission price. So, what will we be doing this year on Stand C11 in Hall 9? Well, we have a brand-new, rather swish stand this year – although it’s still under wraps so we can’t really talk about it yet, but if you did come to visit us last year, we can definitely say it looks completely different! This year is all about the new products on show. X-Rite i1Display Pro, ColorMunki Display, the latest Spyder4 range, Cruxcase, Color Confidence Studio Photo and Studio View to name a few will all be on display and ‘on-demo’ by our colour experts. This gives you the perfect opportunity see the products in action, and learn about how they work and how they can improve your imaging workflow. We’ll also have the latest Booq Python Camera bag range on show and professional graphics tablets from Hanvon. And as is always popular; the latest colour accurate monitors from Eizo and NEC will again be on display for you to see first hand. Focus on Imaging 2012 promises to be a great one – keep an eye on our dedicated Focus microsite for the latest updates, and to claim a £5 show voucher. This entry was posted in Color Confidence, General News, Industry News, Photography and tagged Color Confidence, Focus on Imaging 2012 on January 27, 2012 by colorconfidence. We mentioned in our post last week that we would be looking to do a feature on Nik Software, following our extensive look at onOne Software before Christmas. Have you heard of Snapseed? We initially blogged about Snapseed back in August (which you can read here), and we’re pleased to say that since then, Snapseed went on to win Apple’s ‘App of The Year’ 2011! But is it worth it? Well, in a word; yes. If photo-editing and tuning is relatively new to you, and you don’t have access to programmes such as Adobe Photoshop, then Snapseed is the perfect starting point to learn about the editing process. While not as comprehensive as the Nik Software plug-in range, Snapseed does give you numerous options and capabilities to get you started, giving you a foundation of knowledge that will put you in good stead for future, more detailed image tuning. Snapseed’s greatest feature is its ease of use. On iPad and iPhone especially, editing is as simple as using your finger to swipe and slide effects and corrections to your desired result. The results themselves are, quite simply, amazing. Many of us here at Color Confidence have the App installed (including the works’ iPad) and it’s fair to say we’re completely addidcted to it! 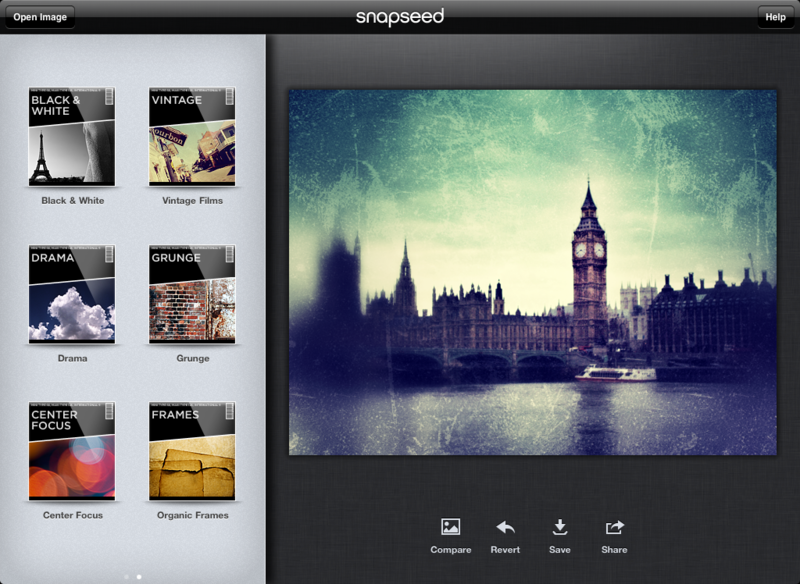 What’s more, you can now install it directly onto your MacBook via the Appstore to get Snapseed power on your Laptop. While probably not the best solution for the more discerning photographers amongst you (there’s the Plug-in software for you guys), for the amateur or enthusiast, Snapseed is a great tool. Image editing with Nik Sotware is easy, comprehensive and professional. A user-friendly and intuitive interface, combined with their U Point technology gives you speed and simplicity to make image adjustments across whole, or selected parts of images using Control Points. When using Nik Software, no longer does editing JPEG, TIFF or RAW files demand complex and time-consuming techniques. What took hours to do in Photoshop can be achieved in minutes with Nik Plug-ins. Global adjustments – ‘sliders’ are used to adjust and apply effects to the whole image, which can be saved for later applications. Selective adjustments – U Point Control Points allow you to edit particular regions of an image. Visual presets – predefined looks give you instant effects, which can be fine-tuned to match your requirements. We’ll look more closely at the way Nik Software use Control Points in their plug-ins, and take a closer look at Color Efex Pro 4 in next week’s post. This entry was posted in Uncategorized on January 20, 2012 by colorconfidence. Exclusive for January, you can get 15% off Nik Software Complete Collection – Photoshop, Aperture & Lightroom edition. Complete Collection includes six essential plug-ins for Lightroom, Photoshop, Elements and Apple Aperture, giving you a whole new level of control in your images. Complete Collection contains; Silver Efex Pro 2, Viveza 2, Color Efex Pro 3 (with free upgrade to Color Efex Pro 4), Dfine 2, Sharpener Pro 3 and HDR Efex Pro. This means you get the complete Nik Software collection, and save a further 15% off an already discounted item! It’s the perfect solution for all photographers looking to get creative when editing images. We previously blogged about the range last summer,you can read our entries here, here and here to get more details about the range. We’ll be looking to do further in-depth reviews of the Nik Software range soon, so keep checking the blog over the next few weeks. Following the launch of the Color Confidence Studio Photo back in December, we’re pleased to announce the Color Confidence Studio View is now in stock and available. The Studio View is the ideal solution to create the perfect working environment/conditions for image editing. The package will give you accurate on-screen colour with the X-Rite ColorMunki Display monitor calibrator, an optimised working environment with the PChOOD Pro and simulated natural daylight for reviewing proofs with the Color Confidence GrafiLite. You can learn more about the Studio View by downloading this PDF product sheet. You can order yours now, here. Focus on Imaging 2012 is only a matter of months away, and as ever, Color Confidence will be attending to showcase our expertise and range of colour management products. We’ll be looking to do a Focus Special blog entry or two, outlining exactly what you can expect from the show, and what lovely things we’ll have on display. This entry was posted in Color Confidence, General News and tagged Color Confidence, Color Confidence Studio View, January sales, Nik Software on January 13, 2012 by colorconfidence. Launched today, we’re pleased to announce three brand new monitor calibration devices from Datacolor – the Spyder4 range. You will probably be familiar with the Datacolor brand, indeed many of you reading this now will more than likely use, or have used a Spyder device to calibrate your screen (By the way, if you’re a photographer or graphic designer and aren’t calibrating your screen, read our post here to see why you really should be). The Spyder2 and Spyder3 range quickly established themselves as both ‘no-nonsense’ devices for accurate monitor calibration, with the option for greater control over the calibration process if required. The Spyder4 series continues this straight-forward, but detailed approach with the latest range. As before, there are three levels of device tailored to meet the needs of various users. All feature Datacolor’s patented 7-colour sensor which improves on the traditional 3-channel RGB sensors found on other devices. Basically, this means you get a more accurate, reliable calibration. The Spyder4 range is also geared to calibrate an iPad – available by downloading the free App. This is the entry-level/beginner model, ideal for image and photography enthusiasts, or for those looking for a quick, but accurate calibration. If you’re relatively new to the process, this is the device for you. It comes with wizard-style software to guide you through the process, making it as straight-forward and easy to understand as possible. You can learn more about Spyder4Express here. This is Datacolor’s intermediate level monitor calibrator, suitable for more advanced photographers or creative professionals. The Spyder4Pro is a perfect solution for those with more knowledge of the monitor calibration process, or seeking greater control and customisation when calibrating. The Spyder4Pro comes with ‘Monitor Quality Analyser’ (MQA) software, for calibration testing plus gamut, gamma and white point graphing. It also has an ambient light sensor to integrate your working environment conditions into the calibration. You can also calibrate multiple monitors, as long as they’re setup on the same system. If you’re looking for greater control of colour management and the calibration process, this is the device for you. 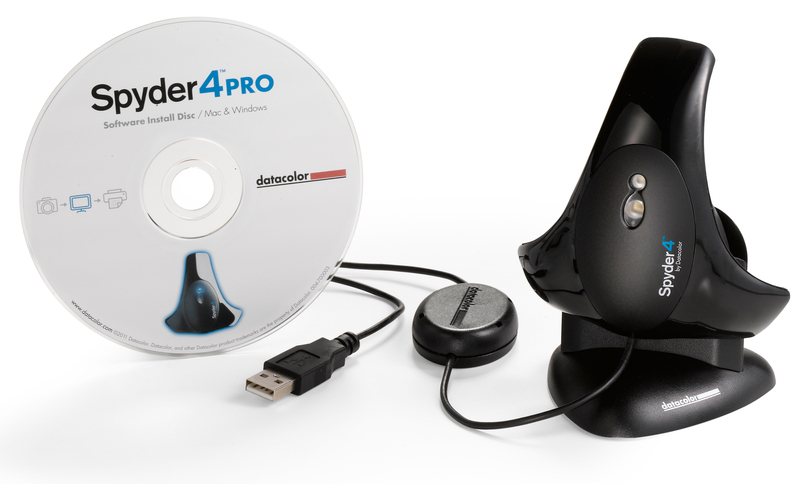 You can learn more about Spyder4Pro here. The Spyder4Elite is an advanced monitor calibration device developed for pro photographers and creative profesionals, or for those whereby precise, accurate on-screen colour is essential. This solution offers the highest level of monitor calibration and projector profiling customisation. The Spyder4Elite has the same features as the Spyder4Pro, plus extra capabilities to take the calibration process up a notch. Advanced MQA (with extra features than the Pro version) software means you can also graph luminance and colour uniformity. With the Spyder4Elite, you can calibrate multiple monitors and workgroups – ideal for studio use. The software also features SpyderTune software, the ultimate fine tuning tool for displays. This really is a device for those that know what they’re doing! You can learn more about Spyder4Elite here. We’re looking to do an in-depth analysis of these devices once we’ve had chance to have a play with them! Keep checking back to the blog and our website over the next few weeks to get our take on the Spyder4 Range. This entry was posted in Colour Management, Monitor Calibration, Photography and tagged Color Confidence, Colour Management, Datacolor, Monitor Calibration, Monitor Profiling, Spyder4, Spyder4Elite, Spyder4Express, Spyder4Pro on January 3, 2012 by colorconfidence.